Transform your business and elevate your skill with hands-on training by the industry’s best instructors. 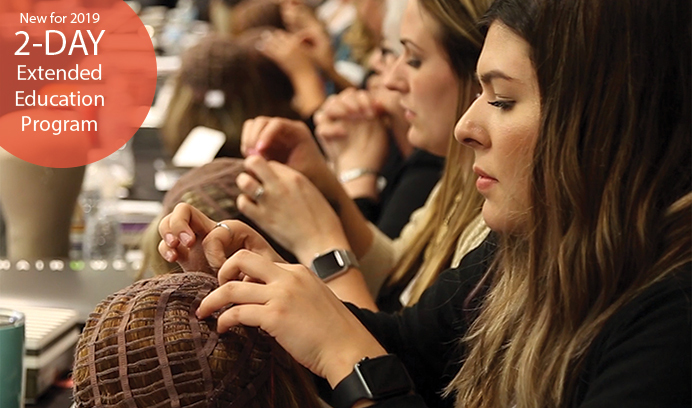 Our new extended program covers everything you need to know about wigs, extensions and hairpieces over two incredible days. Day 2 Policy: To participate in the extended education program on day 2, applicant will be required to have attended day 1 or a single day HairUWear On The Road workshop within the prior 24 months. Important: Reservations are limited and must be made in advance. Walk-ins are not allowed. Dates and locations are subject to change. We offer in-studio training on site for your entire team. Customized training and events tailored to the unique needs of your clients. Contact us for details. Reservations cancelled 10 or more business days prior to the seminar date will be issued a full refund. Reservations cancelled within 9 business days from the seminar date will be charged the full registration fee and will not receive a refund. Registration is transferrable. You may send an alternate attendee from your business if necessary. “No shows” on the day of the seminar will be charged the full registration fee and will not receive a refund.